The Basel, Rotterdam and Stockholm Conventions cooperate in the protection of human health and the environment from the negative effects of hazardous pollutants. This Environment and Gender Information (EGI) platform analysis explores how women are represented as delegates to the Conferences of the Parties (COPs), members and observers of Conventions’ Subsidiary Bodies, and national focal points. It also investigates how gender equality considerations are included in Parties’ reporting mechanisms to the BRS Conventions, including initial National Implementation Plans (NIPs) to the Stockholm Convention and the most recent National Reports to the Basel and Stockholm Conventions. The study also explores how gender considerations are included in the Rotterdam Prior Informed Consent (PIC) Circular. 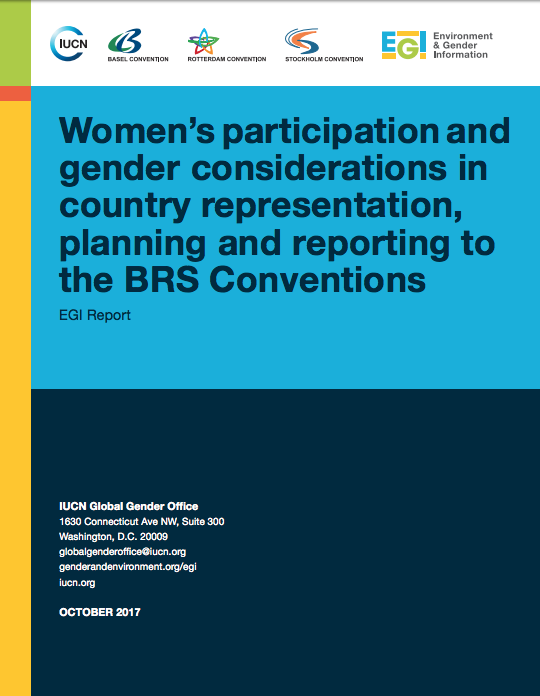 As key stakeholders reflect upon the progress being made toward meeting the objectives of the BRS Gender Action Plan (BRS-GAP), the results of this study are encouraging, particularly with respect to women’s participation in key decision-making processes and the inclusion of gender considerations within initial NIPs. A staggering number of initial NIPs (91%) contain at least one gender and/or women keyword—indicating recognition to some extent of gender considerations and, most commonly, to the differentiated impacts of chemicals and pollutants on women and men. However, Parties are not yet fully integrating or mainstreaming gender considerations within their planning and reporting documents. This study finds that there are many available entry points for enhancing gender mainstreaming to achieve the objectives of the BRS-GAP and, likewise, the obligations under the Conventions.